Paul Smith is selling his beautiful Charles Brand press and all the studio equipment. If you know of anyone who is keen to purchase a press, it’s a real bargain. The press and 4 blankets (etching and embossing), rollers (one huge big bertha and several small soft and hard rollers), plan cabinets and other studio equipment is offered at $5,000 (ono). The press bed size is 1530mm x 915mm. 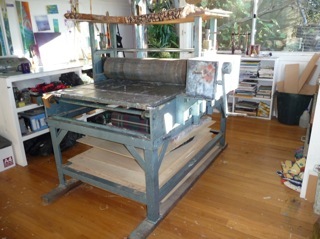 Paul Smith’s large Charles Brand press. The buyer must pay for its removal. Paul has moved it several times with the help of a reliable engineer so he can help with the organisation. Paul lives on Scotland Island, so it is not as simple as it might appear to move the equipment. Please contact Paul through his website.